The Windows Registry has an incredibly complex structure, so often navigating to a certain entry can be time-consuming. Registry Finder is a free utility that lets you quickly search your system’s Registry and shows a list with all the results. Found items can be directly edited or you can jump to the item you want in RegEdit with a mouse click. Also, you can save your search results as a text file. 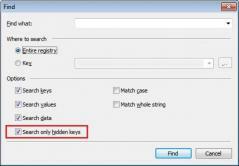 Registry Finder is a portable tool – no need to install it. Simply download the application and run it from your hard-drive or any USB drive. None of the application’s data is stored in the Registry. All of its settings are kept in the program’s folder (where the executable is) in the RegistryFinder.config file.